Nice photo. But, what exactly is going on here? I don’t get it. Like a recent subject of yours (the young man standing next to a baby pram in Stockholm), this shaven-headed gentleman’s sound choice in clothing, evidenced here by the DB blazer with peak lapels, seems to have petered out by the time he got to his feet. I do not understand the trendy habit of wearing ‘sneakers’ or ‘trainers’ with normal clothing. This is one of my style peeves. It’s almost as if trendy shoes help such people feel they are maintaining their street credentials, IMO. 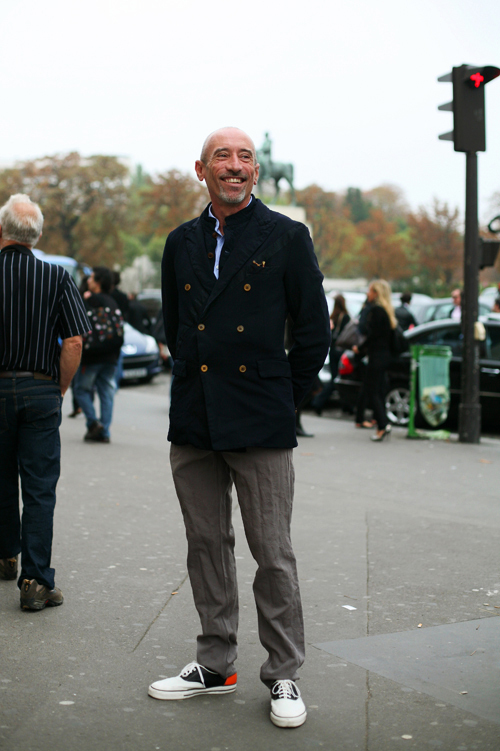 I like this; he’s created a nice calibration of the dressy and the caz. Like his layering and “easy” pants. Red light red shoe. Very urban. Ohh that jacket is awesome – especially that double layering effect. know anything about the shoes? what kind of shoes are those and who makes them? A tailored, sophisticated look that’s still fun thanks to the shoes and the less contstructed fit. but then again, if I am correct in believing that CDG is an acronym for Comme des Garcons, what else could be expected? great look, and normally i wouldn’t be into chunky shoes with the outfit but the red on the heel definitely makes a difference. i love the sneaker style saddle shoes. saddle shoes, to me, are preppy like no other and contrast nicely with the ultimate casualness of the rest of the outfit. nice! Is he a sailor off board? Somehow this idea hit me immediately.I like his happy face.Laguna:Forget the sneakers.I´m getting a bit bored on your comments about the shoes.Let our sailor enjoy his visit on shore-please. now, i know there is no such thing. looks like a sea captain to me. so youthful and hip, yet age-appropriate! Not sure why everyone is so focused on the shoes, other than there is really nothing quit edgy about his look. He looks to be a dashing enough fellow. The outfit is like any other layered casual effect, but for me there is no zing in this. I do not feel the push of the boondry or a reaching beyond convention. Maybe I am missing the point of how a Come des arcons ensemble is youthful or edgy whe Rei has been routing the same razors edge for 30 years. I think you’re on point, and this is something I do, subconsciously or consciously maybe, for this reason. and I think it’s fine. Everyone wear’s sneakers with nicer clothes theses days. Thats why there are so many fashionable, sharp cloth and rubber sneakers on the market right now. This guys shoes are not only acceptable, but stylish and cool. It’s not as though he’s wearing gigantic air-max gym shoes. Laguna, for a guy with the word “beach” in his username you sure are acting stiff about comfortable footwear. Do you ever have to walk or stand up? i want. i need those shoes. Note to Landis…there is no such thing as “too many shoes”…. He’s wearing casual pants, no tie, and his jacket appears to be of a casual material, and therefore I have no issues with his shoes…he’s not taking this style thing too seriously. Which is refreshing. aren’t those the marc jacobs for vans shoes? those are amazing! I think the shoes are Comme des Garcons Homme Plus, I was looking at them in Barneys in LA a few weeks back. I think the whole look is CDG and in my opinion is very very sharp. It reminds me of early CDG shows where the runways were full of older guys looking superb in wrinkly, unstructured suiting with shards of colour coming from sneakers and t-shirts. I think the look is still totally relevant and a good alternative to the slimline Diorism still so dominant. i love this guy – and i dont’ even know him! Sorry, I’ve tried, but I can’t accept the pants. I am in love with his look and his aura. He looks great and at perfect ease with himself. He has that casual slightly edgy but well put together look that I like. this man looks great! look at how he pops compared to the others on the street. sart, i don’t always understand why you like someone’s style or why you may consider it sartorial, but i appreciate the fact that you appreciate others’ fashion expression. those of you that are dissecting these people’s fashion sense are way too myopic and that tells me you don’t have a true appreciation for fashion and style…way too many rules. does anyone know for sure who the shoes are by? i desperately searched the web…but nothing…anyone? About the shoes, CdG Homme Plus of course! Shoes are definitely cdg. 3 colorways at Barn’s right now.